The Chicago Area Paddling/Fishing Pages offer an array of resources about local waterways. The history and water quality information is particularly interesting. The Chicago Area Sea Kayakers Association is a membership organization that has a nifty blog with plenty of trip reports and news about local kayaking topics. The Illinois Paddling Council offers information on safety and outfitters, as well as an extensive listing of places to go for paddling instruction and courses. The local nonprofit organization Openlands helped develop a series of local “water trails,” as they’re called. In addition, they created a series of helpful maps showing local paddling routes, dams, and launching spots. Paddleaway.com has the most detailed information about where to launch your canoe or kayak. The interactive map is great for finding sometimes hard-to-find launch sites. The website also lists local outfitters according to the waterways they serve. Since 1979, the Friends of the Chicago River have been working to improve the health of the Chicago River. Progress has been made, but there’s still much to do. The organization is always looking for volunteers. Speaking of paddling, the Chicago Tribune featured a front page article about Ralph Frese, the 81-year-old local paddling guru, environmental advocate, and longtime owner of Chicagoland Canoe Base. For decades, Frese has championed the exploration and care of local waterways. He has also built canoes, including a 34-foot-long voyageur canoe model that he would sell for more than $20,000. The article focused on Frese’s coming retirement and his inability to find someone to take over his business. Also, last year, Chicago Wilderness magazine published a piece about Frese and his long-term efforts in getting people interested in caring for local waterways. Like to hike? Check out the new edition of 60 Hikes within 60 Miles: Chicago. Not to analyze the situation too much, but one of the reasons I dig my camping hammock is the vaguely womb-like atmosphere it provides. The hammock I use—called the Hennessy Hammock—is a green cocoon that offers the most comfortable sleeping experience outside of my bedroom. Maybe I’m easily impressed, but the Hennessy Hammock (pictured here) seems to be an engineering marvel. You enter the hammock through the bottom. As you lay down, the hole you entered seals up as a result the fabric tension. Admittedly, once inside, it takes work to get everything situated, and you may have to wiggle and twist and push and squirm to get everything just right. But once you do, it’s perfect. Stretching out inside this hammock puts you in a slightly diagonal position that is not flat, but it’s much flatter than most hammocks allow. It’s flat enough for me to sleep on my side. Bug netting held aloft by a center string covers the top of the hammock. A removable fly kept me dry in several heavy downpours. The downfall of camping hammocks is that they’re useful for only part of the year—at least in the Midwest. After a total of two weeks sleeping in the hammock, I discovered that below a certain temperature, I get too cold. Even if I’m wrapped in a down sleeping bag rated to 20 degrees, I get uncomfortably chilled if the temperature approaches 50 degrees. Sleeping on an insulated pad adds warmth, but it tends to slip out from underneath during the night. Another drawback: Because it’s awkward getting situated once inside, the Hennessy Hammock—and camping hammocks in general—are probably not the best option for people who make frequent visits to nearby bushes during the night. Also, I learned the hard way to spray the outside of the hammock with bug repellent if I’m not using my sleeping bag while dozing in the hammock (I’ll spare you the photo gallery showcasing many dozens of mysterious bites on my legs that I acquired through the hammock’s nylon fabric). 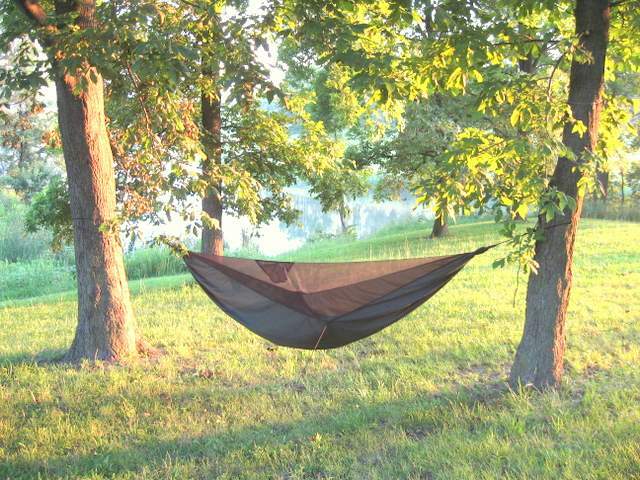 Despite these shortcomings, the Hennessy Hammock is the bees’ knees for summer camping. It comes in various models ranging in price from about $100 to $250. Outdoor gear nerds will salivate over the weight: the model I have weighs 2 pounds, 10 ounces. It usually takes me several minutes to set up. 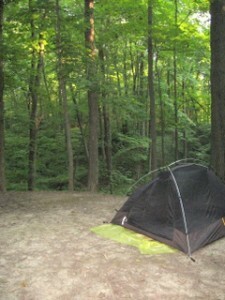 For more info: Backpackgeartest.org offers reviews of a number of camping hammocks, including the Hennessy. Want to experience the thrill of hoboing without the danger of getting mugged while sleeping in a dirty train car? If so, an overnight trip on local rail trails may be just what you need. Well, yeah, it’s true that you’re not going to find any trains along local rail-trails. But you will find that these long linear paths provide an adventurous way of seeing the countryside and experiencing a taste of local history. For a longer rail-trail trip, most people prefer to saddle up on a bike. This is because hiking more than a couple of miles along a gently graded and straight-as-an-airplane-runway trail often induces the desire to nap. And, of course, schlepping your camping supplies is simplified immensely on a bicycle. 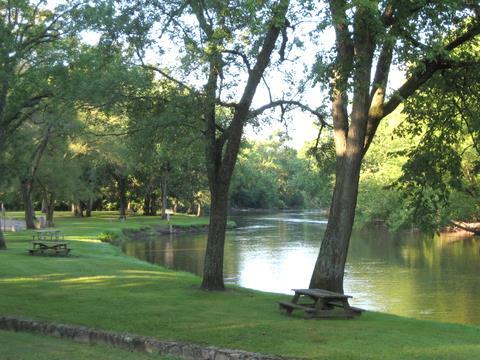 Camping options alongside local rail trails come in various styles, and range from a fire pit and small patch of grass to pitch your tent to red carpet treatment with spacious campsites, picnic tables, nearby hiking trails, and–rejoice–restrooms. Most cyclists choose to ride rail-trails out-and-back. Some opt for leaving a vehicle at one end of the trail. However you do it, here are few options within a 3-hour drive from Chicago. Initially running from Chicago to the Quad Cities, the Rock Island Railroad Line soon branched out to 14 states and played an important role in bringing white settlers west. The railroad acquired nearly mythical status by way of a folk song first recorded in a southern prison in the 1930s, and later recorded by everyone from Lead Belly to Johnny Cash to Pete Seeger. 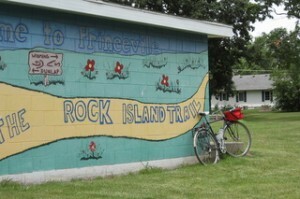 North of Peoria, a section of the Rock Island Line has been transformed into a 26-mile-long path. 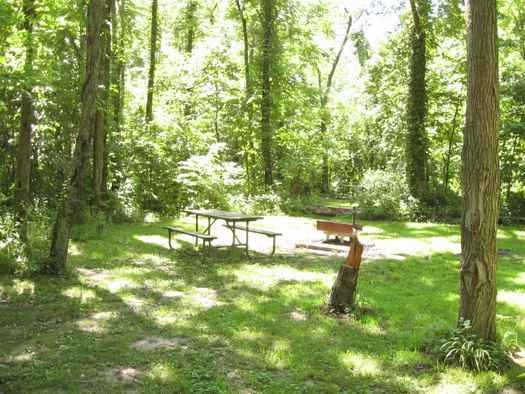 Five miles outside of Peoria, you’ll encounter Kickapoo Creek Recreation Area, a spacious trailside campground within an oak savanna. The park’s campground is specifically for Rock Island Trail users, as well as people who are willing to walk a half mile from the nearest parking lot. While you’re there, take a hike along several trails that run through a restored prairie and alongside a stream. Don’t miss: The graceful old trestle bridge over the Spoon River at the north end of the trail. Completed in 1848, the 96-mile-long Illinois and Michigan Canal provided the final shipping link between Chicago and the Gulf of Mexico. As a result, Chicago became the largest grain market in the world. Mules were guided on a path alongside the waterway as they pulled canal boats halfway across the state. Don’t miss: Between Channahon and McKinley Woods, the route traces a thin sliver of land between the canal and the wide and mighty Illinois River. 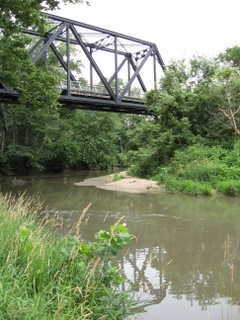 After it was finished in 1907, the Hennepin Canal never gained the prominence of the nearby I&M Canal. The growth of railroads, the waning production of Illinois coal, and the dredging of the Illinois River all conspired to make it obsolete. 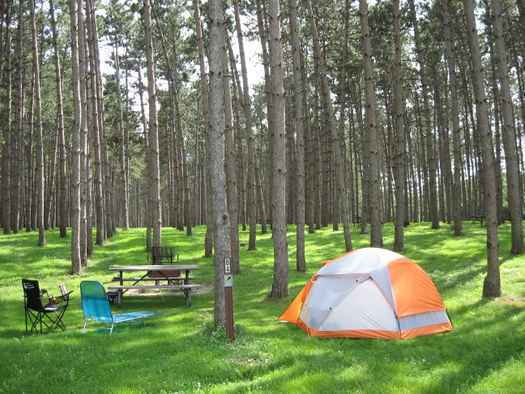 Nine small campgrounds are spaced out along the 62 miles of the main Hennepinn Canal Trail running from north central Illinois to the outskirts of the Quad Cities (camping is not allowed along the 29-mile north spur of the path to Rock Falls). Along the way, don’t expect to see any towns. But you will see big soft shell turtles basking on logs, great blue herons fishing along the banks, and kingfishers and hawks looking for meals from above. Small wooded bluffs often appear alongside the east half of the canal, while wide-open corn country dominates the west half. Don’t miss: 32 locks that were used to raise and lower the boats on the canal and six aqueducts that carried the canal and its traffic across rivers and streams. Named for the many glacial mounds bulging up from the Wisconsin landscape on the eastern half of this trail, the Glacial Drumlin Trail runs from Waukesha to Madison. It cuts through a half-dozen towns and skirts the edges of numerous lakes, ponds, and wetlands. Plenty of farmland appears along the way. 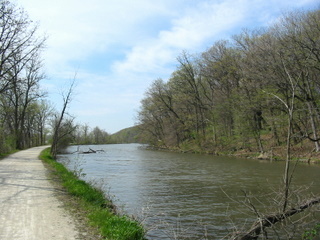 At the west end of the trail, you’ll meet up repeatedly with Koshkonong Creek and cross the southern tip of Rock Lake. Near Lake Mills, keep an eye peeled for a herd of bison. 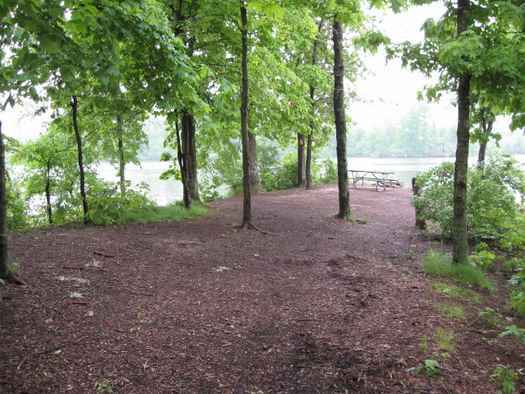 The Sandhill Station State Campground, less than a mile south of the trail near Lake Mills, offers walk-in campsites near the shore of Mud Lake. Keep watch for the campground’s namesake bird, an enormous grey crane with a red spot on its forehead. At the west end of the trail on the outskirts of Madison, cyclists can continue pedaling on the Capital City Trail; the east end of the trail connects with the Fox River Trail in Waukesha. Don’t miss: Between Dousman and Sullivan, the trail passes through a vast marsh busy with waterbirds. Sleeping under the stars is one of the great pleasures of summer. Listening to owls, crickets, and tree frogs while drifting off to sleep promises a peaceful slumber. For many, camping is even better if you’re able to get further into the wild woods, away from parking lots and Dairy Queens. Of course, camping in remote places usually means carrying your own gear. Strapping a tent, sleeping bag, and food on your back will sound unappealing to some. For others, it instills a sense of adventure, freedom, and self-sufficiency. While plenty of options exist for camping around Chicago, most of these places are very busy during the summer. Camping overnight on trails takes you away from the hubbub of a campground. 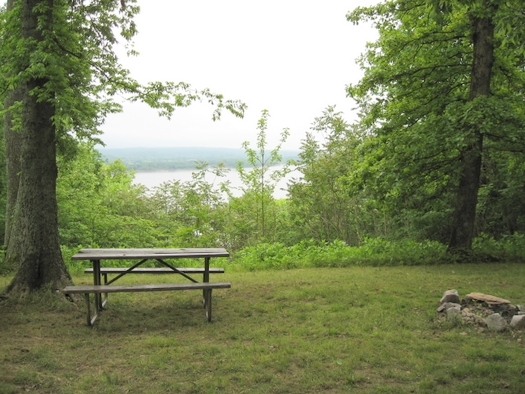 Campsites along trails are nearly always empty and quiet; sometimes reservations may be required, but generally, few people entertain the idea of visiting regional trails overnight. This is part one of a two-part article focusing on overnight excursions that can be found hiking and biking trails in the region. The first installment highlights a few backpacking trails within 3 hours of Chicago. The next installment will look at overnight biking trails in the region. Forest Glen Preserve is a surprisingly large county park nestled alongside the Vermillion River, just south of Danville, Illinois. The park’s 11-mile backpacking trail takes hikers through prairie, savanna, and bottomland woods. Dozens of ravines blanketed with maple and oak trees provide hikers with a thorough workout. (Be sure to hike clockwise so the trail markers are visible). Some of the campsites for the backpacking trail are perched on the edges of these ravines. In spring, the trail comes alive with wildflowers. Some 230 species of birds have been seen in the park, including pileated woodpeckers, a variety of owls, and a full compliment of Illinois warblers. Don’t miss a climb up the observation tower overlooking the river valley. In addition to 25 miles of hiking trails, the park contains a pioneer homestead exhibit, a nature center with live animal displays, and an arboretum where visitors can walk among hundreds of native and non-native trees, shrubs, ornamentals, and conifers. The park is located on the Indiana border 180 miles directly south of Chicago. When completed, the Ice Age Trail will follow a snaking route for some 1,000 miles through Wisconsin along the southernmost edge of the last glacier. Currently, 600 miles of the trail exists in discontinuous segments throughout this terrain dense with lakes, ridges, and rugged hills. Fortunately, a couple of excellent segments of this trail are within striking distance of Chicago. A 35-mile segment of the Ice Age Trail runs through the Kettle Moraine State Forest’s southern unit and an 31-mile segment of the trail runs through the park’s northern unit. The north unit is 150 miles north of Chicago and south unit is 100 miles northwest of Chicago. While the southern unit is more accessible from Chicagoland, the northern unit boasts fewer visitors, more of an isolated ambiance, and less encroachment from nearby development. Both parks feature rugged glacial terrain with ridges, bluffs, thick hardwood forests, and expansive hilltop views. Wetlands, ponds, and small lakes are a matter of course. Both parks offer a handful of primitive shelters alongside the trail for camping. Because you’re in Wisconsin where people like to spend time outdoors, call the park for reservations. Visitors thin out considerably midweek. A sand desert in the middle of Illinois cornfields? Well, yeah, sort of. Fifteen thousand years ago the floodwaters of the most recent glaciers receded down the Illinois River Valley leaving a vast deposit of sand in the area. Shifting winds sculpted 100-foot high sand dunes that now are the wooded ridges for which the forest is named. Sand Ridge State Forest is one of few places in Illinois that supports an intriguing variety of plants and animals more associated with the Southwest than the Midwest. The rolling terrain is covered with oak-hickory woods, plantations of pine, open grasslands, and unique sand prairies. Prickly pear cacti thrive in the sandy soils. At 7,200 acres, Sand Ridge State Forest is one of Illinois’ largest state-operated natural areas. 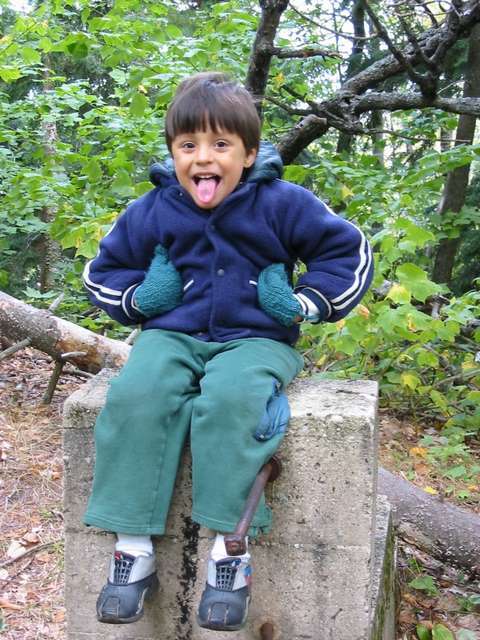 A dozen primitive campsites are located along more than 40 miles of trails. The yellow trail is the longest loop at 17 miles, with tent sites along the way. Be warned, though, many of the trails have a sandy surface, which can be difficult hiking for some. Sand Ridge is about 15 miles south of Peoria and about 185 miles southwest of Chicago. Check out my book, 60 Hikes within 60 Miles: Chicago, recently published in its second edition by Menasha Ridge Press. Prairie Fever is powered by	WordPress 3.5.1 and delivered to you in 0.221 seconds using 29 queries.